Popover needs tooltip plugin which means you should include “bootstrap.min.js” file in your HTML template. With Bootstrap 4, you can use the precompiled “bootstrap.bundle.min.js” file containing “bootstrap.min.js” and “popper.min.js”. In order to improve the performance of page loading, by default popover will not load on page. You should explicitly initialize with the parent element to load the popover. Popover will not be shown when there is no title or content inside the popover. Default popover will hide only if you click on the triggered element again. Otherwise it will be shown even you scroll the content on the page. Dismissible popover will be hidden when you click on anywhere. If you see the styles are interfering code with the popover then you can define a separate container for specific element. Remember to include the initialization script right after “popper.min.js” and “bootstrap.min.js” scripts. In case if you have initialized for body then you should add data-container=”body” attribute to the button. The data-trigger=”focus” attribute is used so that the popover appears / disappears on highlighting with keyboard tab key. Note that the <a> tag is used instead of <button> along with “tabindex” attribute in order to ensure compatibility on different browsers. data-animation will enable or disable the animation of popover. data-delay is used to adjust the show / hide animation delay. data-title is used to show the title or header for popover content. data-trigger is used to trigger the popover on click, focus or hover. 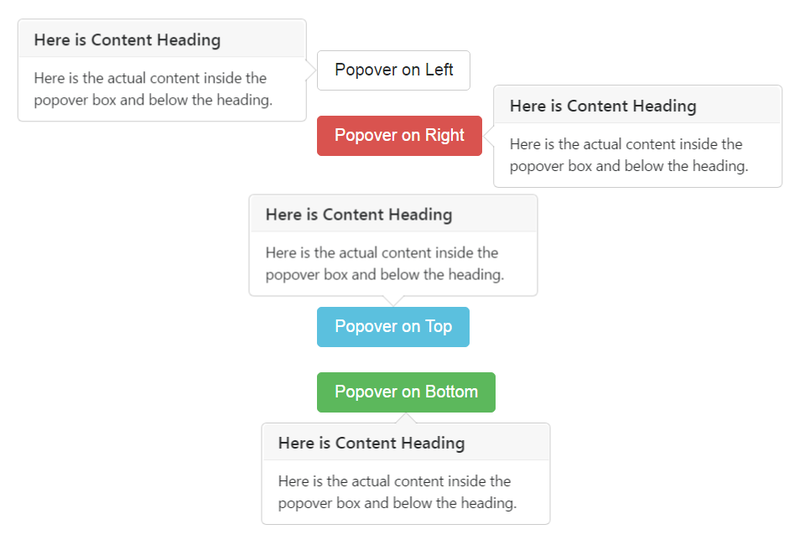 data-html is used to add HTML content inside popover.